It may seem like an incredible stretch of mental gymnastics, but the mining strike is being taken as a sign that enemies are assailing the Alliance from all sides. Enter President Zuma and his shadow, Blade Nzimande. By SIPHO HLONGWANE. The explosion of violence and death at Lonmin’s Marikana operations near Rustenburg threatened to cast a heavy pall over the Cosatu’s elective congress. The confluence of union, company and worker interests at Marikana was the same clash that often dogs the trade union federation’s relationship with the ruling African National Congress. Not only was Marikana a threat to a vital economic interest for the country, it was also a massive challenge for the Cosatu-affiliated National Union of Mineworkers (NUM). As the ruling party, the ANC faced questions about how the police were putting down the unrest. Several political analysts said before the four-day meeting began that the events of Marikana would surely be of great importance. “Marikana is going to overshadow the whole proceedings,” said political analyst and author William Gumede. While Marikana was indeed often mentioned on Monday, it wasn’t in the context of self-examination or introspection. Rather, Cosatu’s guests described the mining unrest as an assault upon the tripartite alliance. It was ANC president Jacob Zuma who set the scene. He defended the police action at Marikana, saying that those who likened it to Apartheid were using the occasion to score political points. For Zuma to speak in such a situation (some inter-union tensions were still evident when a call to adopt the congress agenda inexplicably bogged down) required easy common ground, and he found it in Marikana. “Given the levels of violence and intimidation in Marikana, government deployed law enforcement agencies to stabilise the situation. This does not take away the rights of miners and residents to protest, peacefully and unarmed, as provided for in the laws of the land. The agencies have been told to be firm, but to respect the rights of residents and strikers,” he said. On Friday, the security cluster ministers announced that they would crack down on illegal gatherings, intimidation and violence in the area. This was followed by a raid on Saturday morning on Nkaneng, near Marikana (the focal point of the Lonmin strike), and the hostels at the Karee mine. Clashes between protesters and police resulted in the latter firing teargas and rubber bullets indiscriminately. “We appeal to some political party leaders in the country, who have been vocal, to desist from the irresponsible language of comparing the Marikana law enforcement campaign to Apartheid-era measures,” Zuma said. At about the same time that Zuma was speaking at Gallagher Estate in Midrand, the police were scuffling in Marikana with expelled ANC Youth League president Julius Malema, who had arrived to speak to the striking miners. He was escorted out of the area after he was refused entry into a stadium where the workers gathered. SACP boss Blade Nzimande was especially frantic in his criticism of everyone who may have said anything against Zuma’s government at Marikana. The claim that the country is facing a leadership crisis is “an ideological fad aimed at discrediting President Jacob Zuma’s government”, apparently. In his usual, jargon-laden style, he said that the alliance was under attack from both the DA and Malema. The point of this attack (at this point he pulled “the media” into this army of haters) was to label the alliance as leaderless and to sow doubt among members. “The anti-union offensive has intensified and grown more desperate in recent months. It is an offensive supported by sections of imperialism. We have seen the DA attempting to out-Malema Malema by leading a march on Cosatu head-quarters with a rag-tag army of suburbanites and desperate and misguided township youth,” he said. 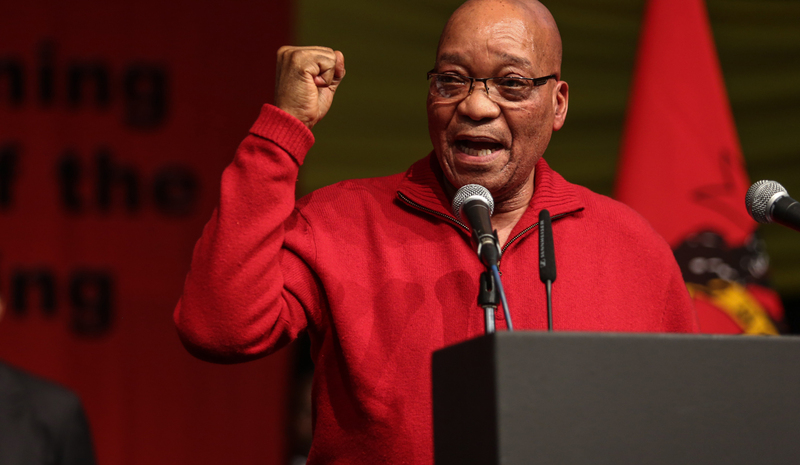 Cosatu has spent the last five years fighting a bitter battle to save Zuma’s career, and then to campaign for changes in the ANC; the evidence in the platinum sector is that they may have forgotten to fight for worker rights instead. The people whom they are supposed to represent couldn’t have been terribly happy with union service if up to 49% chose to go unrepresented rather than join NUM.